sources of vitamin C. They grow on small evergreen trees. The juice of the lemon is highly acidic, 5-6% citric acid, this is what gives a lemon its sour taste. Lemons grow well here in most Hawaii climates. Meyers, Eurekas, Variegated Pink are currently the most common and found in local farmers markets and backyards. 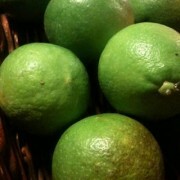 Eureka is most widely cultivated commercially and the lemons we most often see in the supermarkets. food retail chain store routes so we are extremely fortunate they grow so well here in Hawaii and can be found in a lot of backyards and farmers markets. The Meyer is a cross between a lemon and possibly an orange or a mandarin. Its name is attributed to Frank N. Meyer, a USDA explorer who is said to have brought the first plant into the U.S. in 1908 from travels in China. Variegated Pinks are also sometimes found growing in backyards and small farms. Its a varietal of Eureka or Lisbon cultivars and has variegated patterns on its leaves and rind when fruit is green and immature. Upon maturing it turns to yellow and the variegated pattern recedes. When ripe its flesh and juice are pink or a pinkish orange. – If you need just a little juice out of a lemon, some folks pierce one end of the lemon with a fork, squeeze out the juice needed, cover the holes with plastic wrap or tape, and refrigerate. Except for its seeds every part o the lemon is used – juice, flesh, rind. – Lemon rind that is grated is known as zest. Zest is used for the aromatic oils of the lemon that are concentrated in the rind. Rind can be peeled, tightly wrapped and frozen to be later finely chopped and used in recipes. – Lemons can be preserved through pickling methods. Indian and Moroccan cuisines use preserved lemons extensively. – Rub a lemon on wooden cutting board and leave over night. then wash. Select lemons that are heavy for their size. Locally grown Meyer Lemons are often sold green or greenish yellow. This is fine, farmers say that the fruit flies are attracted to the yellow fruit so pick them still green so they can get them to market. Our experience is that these greenish yellow ones are ripe enough for our use. Fresh Lemons will keep for up to five days on the counter. Keep dry and out of direct sunlight. They will last 2-3 weeks in the refrigerator, best if in an open plastic bag to limit loss of moisture, also keep rotating them to prevent too much moisture that can lead to mold. It is believed that lemons first grew and were cultivated in China. Genetic research has led to evidence that the lemon is a hybrid between an orange and a citron.